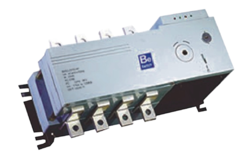 Leading Manufacturer of manual change over switch, change over switch, motorised auto change over switch, onload changeover switch and auto transfer switch from Ahmedabad. 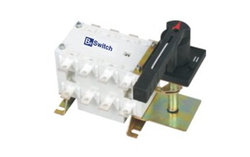 We have attained wide reputation in the market by providing best in class Motorised Auto Change Over Switch. The current rating of this advanced and multipurpose controller unit ranges from 100 to 160 A. these are manufactured by using modern machinery and are available with both auto and manual transfer mode for better efficiency. Current rating up to 100-1600A. Advanced Multi Purpose controller unit. Electrical Mechanical Interlock by key. We have gained huge success in rendering high in demand Change Over Switch. Rendered by us in various technical specifications, these products are fully automatic in nature and are equipped with LCD display. Rich attributes such as easy installation, high performance, automatic operation and enhanced functional life make these products highly demanded. Current rating up to 125-600A. Advanced & Multi Purpose controller unit with LCD Display. Auto & Manual transfer mode. Electrical & Mechanical Interlock by key. Advanced & Multi Purpose controller unit. Advanced Multi Purpose controller unit with LCD Display.